There have been many accounts of the return to the wild of tame animals, but since its original publication in 1960, when the New York Times hailed it as a "fascinating and remarkable book," Born Free has stood alone in its power to move us. Illustrated with the same beautiful, evocative photographs that first enchanted the world forty years ago and updated with a new introduction by George Page, former host and executive editor of the PBS series Nature and author of Inside the Animal Mind, this anniversary edition introduces to a new generation one of the most heartwarming associations between man and animal. The astonishing story of Joy Adamson's friendship with Elsa the lioness and her cubs.LIVING FREE is a vivid, day-by-day record of the development of this friendship, from the time of Elsa's mating with a wild lion until her cubs are one year old. The moving and dramatic climax to the story of Elsa and her cubs. For animal lovers, nature enthusiasts, and the vast readership for gripping true-life stories, this African saga is a must-read adventure. It chronicles the unique Harnas Wildlife Foundation in Namibia, where Marieta van der Merwe and her family, former wealthy cattle farmers, have sold land to buy and care for embattled wildlife. We meet Sam, the "AIDS" lion infected by mistake at a vet clinic. Boerjke, a baboon with epilepsy and Down syndrome. Savanna, the one-eyed lioness. And Marieta van der Merwe herself, the inspiring proprietor of Harnas who shares her home with needy wild animals. Survivor of an early life fraught with personal tragedy in the African Bush, she now devotes herself as care-giver and ambassador for wildlife and wildland. Told with insight, humor, and thrilling immediacy by author and Harnas volunteer Barbara Bennett, this story will captivate readers of all ages. As a self-taught animal behaviorist, Richardson has broken every safety rule known to humans when working with these wild animals. Misconceptions that breaking an animal's spirit with sticks and chains is Not the best way to subdue them. One day, Ralph Helfer, a celebrated animal behaviorist, received a surprising phone call. His close friends had found a young lion near death by the Zambezi River in Zambia and had rescued him and brought him back to the States. Ralph had often spoken of wanting to raise a lion from a young age -- he had been developing a philosophy of training animals based on love instead of fear, which he termed "affection training." Weeks later, Zamba, then a two-month-old cub, arrived. As Helfer peeked into Zamba's box, he saw a small lion cub tilt his head, wait a single beat, then amble right into his arms. Hugging Helfer's neck with his soft paws, Zamba collapsed on his chest, got comfortable, and fell asleep, their faces touching. They didn't move for the next two hours. Zamba was home. For the next eighteen years, Zamba would appear in many motion pictures, on television, and in the pages of magazines. Along with Helfer's other famous animal actors -- including Modoc the circus elephant and Gentle Ben the bear -- Zamba proved Helfer's theories resoundingly correct, and affection training revolutionized the way animals are trained and treated in the motion picture industry. Through both happy and tough times the bond between Helfer and Zamba developed into the most important of their lives, and Zamba is now enshrined in Helfer's heart and the memories of moviegoers everywhere as the greatest lion that ever lived. With stories that range from the hilarious to the incredibly sad and poignant, Zamba will give any Lion King fan a new hero and touch every animal lover's heart. Did you know that European royalty once used cheetahs to hunt deer, or that caracals can capture birds by leaping six and a half feet straight up into the air from a standing start? Have you ever wondered whether domestic cats really do land on their feet when they fall, or how Canada lynx can stalk their prey in the winter without falling through the deep snow? Wild Cats of the World is a treasure trove of answers to questions like these, and many others, for anyone who's interested in learning more about the world's felids, including the ones with whom we share our homes. Mel and Fiona Sunquist have spent more than a decade gathering information about cats from every available source, many of them quite difficult to find, including scientific papers, descriptions of hunts, archeological findings, observations by naturalists and travelers, reports from government agencies, and newsletters from a wide variety of organizations. Weaving information from these sources together with their own experiences observing wild cats around the world, the Sunquists have created the most comprehensive reference on felids available. Each of their accounts of the 36 species of cat contains a description of the cat, including human interactions with it, as well as detailed data on its distribution, ecology and behavior, status in the wild, and efforts to conserve it. Numerous photographs, including more than 40 in full color, illustrate these accounts. Ranging from the two-pound black-footed cat to the five-hundred-pound tiger, and from the African serval with its satellite-dish ears to the web-footed fishing cat of Asia, Wild Cats of the World will fascinate and educate felid fans of any stripe (or spot). Eric Dinerstein relates his experiences searching for Tigers in Nepal serving as a Peace Corp volunteer who was in the midst of attaining a biology degree. Dinerstein humorously writes about the dangers of mud, overflowing rivers and wild animals as well as tracking methods used to locate the number of tigers. The second half of the book focuses on a trip that Dinerstein and biologist, Helen Freeman, made to higher altitudes in search of snow leopards. There is nowhere on Earth like Africa for observing wild cats. A week spent in the superb national parks and game reserves produces almost guaranteed sightings of the three most spectacular and sought-after species - lions, cheetahs and leopards. Yet, alongside the big three, Africa is home to a further seven species of cat far less conspicuous than their larger cousins. Of these, the caracal, serval and African wildcat are marginally better known, while few people have seen the remaining four - the black-footed cat, African golden cat, jungle cat and sand cat. Rarely observed and little understood, most have never been the focus of dedicated scientific research. This book covers all 10 species. Inevitably, the bias is towards the large, well-studied cats but it includes all that is known about the smaller species, including observations and data from their Asian range or from captivity to fill in some gaps. Chapters deal with evolution and anatomy, predation, social systems, reproduction and survival, competition and conflict, and conservation, and include the most current research findings from around the continent. Supported by a wealth of dramatic and beautiful images, this is a comprehensive overview of the cat family in Africa - from the famous and popular African parks with their celebrated, safari-friendly felids, to the few remaining places on the continent uninhabited by people, where a wild cat may spend its entire life without feeling the effects of the human presence. Unfortunately, such untrammelled freedom is rare. The challenges facing cats in Africa are profound. Only one, the ubiquitous domestic cat, does not require dedicated conservation activity to ensure its survival for the next century. More than at any time in history, the fate of Africa's wild cats is in our hands. When two six-week-old leopard cubs, born in captivity in Zimbabwe, arrive at the Londolozi private game reserve in South Africa, 22-year-old game ranger Graham Cooke is assigned to take care of them. Based in an unfenced tented camp in the Londolozi bush, where lions, hyenas and other leopards abound, Graham’s first task is to gain the cubs’ trust before he begins to guide them towards release in the wild where they can assume their role as Africa’s most efficient predators. After weeks of infinite patience and gentleness in his interactions with them, Graham is eventually accepted into the cubs’ small family unit and, with a growing understanding of their behaviour, he finds ways of communicating with them. Slowly, he begins to introduce the young leopards to their new environment. Tapping into their individual personalities, Graham finds himself particularly drawn to the reserved and aloof little female whose wariness contrasts sharply with her brother’s easy-going nature. But, over time, both cubs come to recognise him as their protector and friend and he forms a unique bond with the young leopards which enables him to gain unparalleled insights into their development and behaviour. When, a year later, the cubs are relocated to the Zambian wilderness in preparation for their release into the South Luangwa Valley, Graham has to face the hardest task of all: to set free the young charges he has become devoted to so that they can return to a wild existence where he is unable to control their fate. After the death of George Adamson at the hands of poachers, Gareth Patterson adopted his three orphaned cubs in Kenya and moved the lions to the safety of the Tuli bushlands in southern Botswana. Here, he and his girlfriend Julie set about returning the lions to the wild state as Adamson had wished, divorcing them from the only family they knew – mankind. Gareth’s life with the lions is movingly told: everyday encounters with ferocious opponents such as a leopard or, more worryingly, a bull elephant are lessons for the young lions as he seeks to educate them in the skills they’ll need for coping in the wild. Some meetings, such as the pride male Batian’s with a baby porcupine are humorous; others, with a rival male lion, nearly tragic. Last of the Free is an evocative, vivid and intimate depiction of these lions’ daily life. It is also a heartfelt plea, drawing attention to the wanton and savage destruction of one of the world’s most beautiful creatures. In love with India’s jungles and wildlife, where excitement and danger is ever present, the authors bring the jungle, animals, and human characters to life with their unique style of writing. Teeming with memorable characters—such as the cunning man-eating tigress of Achanakmar, Masan Baba, the tantrik who took on a leopard armed with just a pair of tongs, and Baba Sita Ram Das, the sadhu who tended to crocodiles but lost his hand in the bargain—and interspersed with narratives of some British hunters of yore, these real life jungle tales are bound to entertain casual readers and wildlife enthusiasts alike. The book provides a keen insight as to why these man-animal conflicts happen and what we, as a worldwide community, can do to decrease their tragic occurrence. Through anecdotal tales, the authors also provide tips and tricks for understanding basic wildlife behavior, from alarm calls to eating habits, thus preparing readers for their own personal encounters in the wild. The authors are very passionate about tigers and spend most of their free time at tiger reserves and national parks of Northern and Central India studying the state of conservation work there. Their jungle excursions give them an opportunity to write about many man-beast encounters that are true accounts of their own experiences and interviews with the characters involved in these incidents. They cover parts of India that are still relatively unknown and not as well-documented as other wildlife tourism-friendly locations in the country. Environmentalist, independent researcher and author, Gareth Patterson has spent his entire adult life working tirelessly for the greater protection of African wildlife and, more particularly, for that of the lion. Born in England in 1963, Gareth grew up in Nigeria and Malawi. From an early age he knew where his life’s path would take him – it would be in Africa, and his life’s work would be for the cause of the African wilderness and its wild inhabitants. His is an all-encompassing African story. From his childhood in West and East Africa to his study of a threatened lion population in a private reserve in Botswana to his work with George Adamson, celebrated as the ‘Lion Man’ of Africa, we witness Gareth’s growing commitment to his life’s mission. This is nowhere more evident than in his account of his life as a human member of a lion pride, experiencing life and death through its eyes, as he successfully rehabilitated three famous orphaned lion cubs back into a life in the wilds. At considerable risk to his own personal safety, he exposed the sordid canned lion ‘industry’ in South Africa, bringing this shameful practice to international attention. After moving to the Western Cape he took up the fight for the African elephant, notably the unique endangered Knysna population, and published his astonishing findings in his 2009 book The Secret Elephants. Perhaps unsurprisingly, given the stressful nature of his work, Gareth suffered a massive physical and mental breakdown in his forties, which he discusses here for the first time with an openness that underlines his courage. Lesser men might have been broken, but his ‘lion’s heart’ fought back and he ultimately overcame his illness. Gareth Patterson’s long-awaited autobiography is a moving account of one man’s single-minded dedication to the preservation of Africa’s wildlife. It is also a stark reminder that if the human race does not want to lose Africa’s priceless wild heritage there is no time to waste. ‘The lion is my totem animal, and this is the story of my life in Africa, for the lion. When George Adamson was murdered by the hand of poachers, Gareth Patterson vowed to continue his work. He successfully cared for and nurtured Adamson's lion cubs, who had been orphaned once again in the wild. Batian, Furaha, and Rafiki became his life's work. Gareth prepared them for all the dangers they might face, but unfortunately could never completely guard them from their most lethal enemy - man. Too soon, Batian, the pride male, became the victim of a cruel murder, which left the last of the Adamson lions fighting for their survival. With My Soul Amongst Lions follows Patterson's continued battle to protect the lions and all other life in the bush: from the beautiful serene moments resting with his pride to his dangerous patrols of the bushlands, often alone and without a weapon, in the punishing heat of a cruel, dry summer. Now even more determined and passionate about his cause, Patterson struggles on in the name of the lions who are lost, and for the lions of the future. Never before has such dramatic and moving natural history been told so evocatively. This is Gareth Patterson’s account of his investigation into the ‘canned’ lion industry in Southern Africa, where lions are bred in captivity for the sole purpose of being hunted and killed by high-paying trophy hunters. He unveils the ugly parallels that exist between the oppression of humans in the ‘old’ South Africa and the continuing cruel exploitation of wild animals in the ‘new’ South Africa. He exposes the myths of South Africa’s conservation image and how, even at present, these myths are largely believed and unquestioned. Even now, hunting is still openly ‘sold’ to the public as an integral part of ‘conservation’ rather than for the use and profit of humans. Patterson argues for a return to the African environmentalism with which trophy hunting and the killing of animals for sport is utterly incompatible. Although this controversial book makes for grim reading, it is nonetheless uplifting in that it fuels hope for the end of a morally dubious industry that lives on death. Both (Adamson and Patterson) respected the lion's character, and its place in nature's hierarchy. Both wished to share their lives with this great predator. Both have had their wishes fulfilled...their extraordinary rapport with lions established a spiritual bond that continues to this day.' Virginia McKenna, award-winning actress and co-founder of the Born Free Foundation. Moments later Rafiki appeared, a full-grown lioness in her prime. I could hear the thud of her feet as she ran straight at Gareth, then rose on her hind legs to place her huge paws over his shoulders, while he in turn hugged her...and the big lioness grunted with pleasure at seeing her friend again. Twelve years ago I had watched George Adamson being greeted in exactly the same way when he introduced me to his wild pride at Kora (in Kenya). It was a sight I had never expected to see again; yet here I was in Botswana, watching the man who had so modestly assumed the Adamson mantle.' Brian Jackman, award-winning author of The Marsh Lions and Roaring at the Dawn. The editors utilize their 50 years of combined experience in professional engagement with the behaviour and ecology of wild felids to draw together a unique network of the world's most respected and knowledgeable experts. For the first time, this inter-disciplinary research programme is brought together within a single volume. Beginning with a complete account of all 36 felid species, there follow 8 comprehensive review chapters that span all the topics most relevant to felid conservation science, including evolution and systematics, felid form and function, genetic applications, behavioural ecology, management of species that come into conflict with people and control of international trade in felid species, conservation tools/techniques, ex situ management, and felid diseases. 19 detailed case studies then delve deeply into syntheses of the very best species investigations worldwide, written by all the leading figures in the field. These chapters portray the unique attributes of the wild felids, describe their fascinating (and conflicting) relationship with humans, and create an unparalleled platform for future research and conservation measures. A final chapter analyses the requirements of, and inter-disciplinary approaches to, practical conservation with cutting-edge examples of conservation science and action that go far beyond the cat family. Last seen in the 1880s, cougars (also known as pumas or mountain lions) are making a return to the plains regions of the Midwest. Their comeback, heralded by wildlife enthusiasts, has brought concern and questions to many. Will the people of the region make room for cougars? Can they survive the highly altered landscape of the Midwest? Is there a future for these intrepid pioneers if they head even farther east? Using GIS technology, and historical data, among many other methods, Phantoms of the Prairie takes readers on a virtual journey, showing how the cougar might move over the landscape with minimal human contact. Drawing on his years of research on cougars, John W. Laundré offers an overview of what has been, what is, and what might be regarding the return of cougars to their ancestral prairie homeland. Tiger conservation is one of today’s most pressing environmental issues. From a world population of approximately 100,000 tigers in 1900, these majestic carnivores have dwindled to less than 3,500 in the wild today, much of this due to poaching and habitat destruction. A true adventure tale from the author of the award-winning The Soul of the Rhino, Bones of the Tiger tells the fascinating story of one man’s quest to save the man-eating tigers of Nepal. Set in Royal Chitwan National Park, it is also a timely story, given that 2010 is, in much of Asia, the Year of the Tiger. Unique in explaining the real story of atypical tiger behavior behavior that ultimately leads to conflict with humans, sometimes resulting in deaththis book also includes stunning photos by renowned Japanese photographer Mashahiro Iijima. The end of the twentieth century draws near and with it comes a reckoning. Rapid population growth and industrial development have had a devastating impact on the natural world. In a few years, many of the animal kingdom's most extraordinary creatures, including the magnificent wild tiger, will be hounded and hunted out of their natural habitats, never to roam free again. We have entered the age of extinction. It was with an awareness of this unfolding tragedy that naturalist and safari-tour leader Richard Ives embarked on a remarkable journey through India, Nepal, and Southeast Asia in search of the vanishing wild tiger. What ensued was a quest that would bring him face-to-face with the contest for survival between man and animal. And it would put him into contact with the fascinating individuals who live in the shadow of this destructive battle: "Billy" Arjan Singh, proprietor of a tiger sanctuary, who continues a fifty-year struggle to preserve a portion of the fast-dwindling Indian forest; the mysterious Werther, an intense and lonely wanderer whose travels in the world's evaporating wildernesses have left him in frightening despair; and the wealthy Indian businessman whom Ives thinks of as his "informant," whose obsession with the tiger springs from a harrowing incident in his youth that has left lifelong scars. The Cougar is a skillful blend of natural history, scientific research, First Nations stories, and first-person accounts. With her in-depth research, Paula Wild explores the relationship between mountain lions and humans and provides the most up-to-date information on cougar awareness and defense tactics for those living, working, or traveling in cougar country. Considered one of the greatest man-eating sagas of all time, The Man-Eaters of Tsavo is the firsthand account of the infamous Tsavo lions. These lions-- who for nearly a year terrorized East Africa-- succeeded in bringing the construction of a railway line to a complete halt, and have been credited with the deaths of some one hundred people. Written by the legendary officer who shot these lions and risked death several times in the attempt, The Man-Eaters of Tsavo is not only the story of this breathtaking hunt, but of Lieutenant-Colonel Patterson's other adventures in the African bush. Jason Bristol, ex-prize fighter and expert animal tracker, and part-time drunk, teams up with beautiful wildlife biologist Norah Phelps as they pursue a man-eating predator that threatens to derail her father's prize real estate development project in north central Idaho. Against the majestic pristine backdrop of Idaho's Bitterroot Wilderness Area, the adventure unfolds. Jason, with Norah's assistance, soon discovers the ghosts of his past are nothing compared to the battle he's undertaken. Smilodon. A saber-toothed cat. He's angry, he's frightened, he's hungry, and he's 12,000 years from home! During three seasons in British Columbia's Selkirk Mountains, RD Lawrence observed (and was observed by) a puma in its remote natural habitat. His endearing story describes the special relationship between man and wild animal, and of his own survival alone in a perilous and unforgiving wilderness. But foremost, The Ghost Walker is a story of a patient and dedicated pursuit to understand the elusive puma and its place in the environment. Combines photography, research, and personal observations of the worlds eight big cats. Cheetahs of the Serengeti Plains is the most comprehensive account of carnivore social behavior to date. Synthesizing more than a decade of research in the wild, this book offers a detailed account of the behavior and ecology of cheetahs. Compared with other large cats, and other mammals, cheetahs have an unusual breeding system; whereas lions live in prides and tigers are solitary, some cheetahs live in groups while others live by themselves. Tim Caro explores group and solitary living among cheetahs and discovers that the causes of social behavior vary dramatically, even within a single species. Why do cheetah cubs stay with their mother for a full year after weaning? Why do adolescents remain in groups? Why do adult males live in permanent associations with each other? Why do adult females live alone? Through observations on the costs and benefits of group living, Caro offers new insight into the complex behavior of this extraordinary species. For example, contrary to common belief about cooperative hunting in large carnivores, he shows that neither adolescents nor adult males benefit from hunting in groups. With many surprising findings, and through comparisons with other cat species, Caro enriches our understanding of the evolution of social behavior and offers new perspectives on conservation efforts to save this charismatic and endangered carnivore. Tiger Tales and Other Big Cat Stories by Deborah Chancellor. True stories about tigers and other big cats contain lots of information about these beautiful creatures along with a strong conservation message. Esteemed for its speed and athleticism, admired for its grace and beauty, coveted for its hunting prowess, the cheetah has nonetheless been harassed and hounded to the point of extinction. Author Luke Hunter looks into the history, evolution, behavior and day-to-day survival of one of the most fascinating of the big cats. He discusses the ancestry of the cheetah, its hunting strategies, reproduction, social behavior and status throughout Africa and Iran - the last remaining pocket of the species in Asia. Hunter also focuses on the tenuous future of the cheetah, its decreasing habitat and declining numbers, and deals with the immediate and long-term conservation issues facing the species. His authoritative text highlights the latest research on cheetahs, dispelling the myths and providing a comprehensive overview of the cheetah in the wild. Throughout the book, his first-hand field observations supplement data on the latest ecological discoveries from cheetah researchers across Africa. Powerful, full-color photographs by Dave Hamman make this book a visual feast and reveal a world that is both intensely private and highly dramatic. Hamman's portrayal of the many modes and activities of this elusive animal presents a sumptuous gallery of photographs, while at the same time serving to broaden our knowledge - and help ensure the survival - of this remarkable and beautiful cat. These beautiful books are companion volumes to the popular Animal Planet television series, Big Cat Diaries, which explores the history, biology, behavior, conservation, and survival of big cats inside and outside Kenya’s 600-square-mile Masai Mara Game Reserve. With their stunning color photographs and fascinating, first-hand narration, these companion books offer a rare insight into the lives of these magnificent animals. Presenter, author, and photographer Jonathan Scott has written about the Mara cats for over 25 years; his books include Mara-Serengeti and Kingdom of Lions. Angie Scott, born and raised in Africa, is an award-winning wildlife photographer. This is a companion volume to the popular Animal Planet television series, Big Cat Diaries, which explores the history, biology, behavior, conservation, and survival of big cats inside and outside Kenya's 600-square-mile Masai Mara Game Reserve. With their stunning color photographs and fascinating, first-hand narration, these companion books offer a rare insight into the lives of these magnificent animals. Other titles in this series include Lion and Leopard. About the Author: Presenter, author, and photographer Jonathan Scott has written about the Mara cats for over 25 years; his books include Mara-Serengeti and Kingdom of Lions. Angie Scott, born and raised in Africa, is an award-winning wildlife photographer. 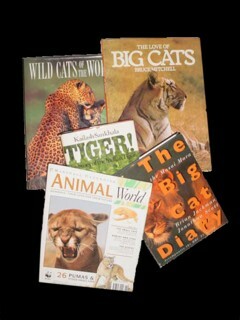 'Collins Big Cat' is a guided reading series for ages 4-7. Children's authors and illustrators have created fiction and non-fiction books that your children should love to read, banded to help you choose the right book for every child. Practical teaching notes are included at the back of each book. Complete account re-sightings of big cat predators in Britain. First published in 1993, with a new and updated preface, this book is based on two years of intensive field study in Kruger National Park in South Africa. Ted Bailey examines leopard population characteristics, activity and habitat use patterns, movements, feeding ecology, and social organization, and provides new information on leopard mortality, scavenging, and relationships to other large predators and to humans. Illustrated with photographs, maps, graphs, charts, and tables. For professional wildlife biologists, students, and others concerned with the natural history of large carnivores. Ted Bailey is a retired Kenai National Wildlife Refuge wildlife biologist who has lived on the Kenai Peninsula in Alaska for more than 27 years. He is an adjunct instructor at the Kenai Peninsula College. "Bailey has added a substantial and high-quality work." Science 1994 264:1004-1005 "The leopard remains an enigma in conservation. It is a difficult task for biologists and managers to balance their desires to protect such a species and also promote systems increasing the values people place on the species. It may be the mystery and chase that elevate the value of the trophy, be it fur or photographic. This book provides clues for many new mysteries around the leopard. J Wildlife Management 1995 59:191-192 "It represents simply the most comprehensive treatise on the leopard available to date." Julian C. Kerbis Peterhans, Center for Evolutionary and Environmental Biology, The Field Museum. Over 100 photos of fierce and magnificent big cats. The wonders of the big cats revealed through facts and photos. Book Dimensions: 8 3/8 inches wide x 11 inches tall. Based on three years of study in the Serengeti National Park, George B. Schaller’s The Serengeti Lion describes the vast impact of the lion and other predators on the vast herds of wildebeest, zebra, and gazelle for which the area is famous. The most comprehensive book available on the lion, this classic work includes the author’s findings on all aspects of lion behavior, including its social system, population dynamics, hunting behavior, and predation patterns. The extraordinarily diverse Indian subcontinent covers a vast area extending from Pakistan in the west to Bangladesh in the east and stretching north to the Himalayan kingdoms of Bhutan and Nepal. Marked by dramatic extremes of climate and terrain, it is home to black bears, snow leopards, elephants, and flying lizards, and it is the only place in the world where both lions and tigers reside. After a lifetime devoted to the study and conservation of the tiger, Valmik Thapar turns his attention to the plants and animals that share the tiger's domain. How have so many species survived on such a crowded continent, where twenty percent of the world's population exerts intense pressure on the environment? Thapar links the region's tremendous diversity to the reverence shown to nature by Eastern religions, including Hinduism, Buddhism, and Jainism. But fifty years after India's independence, modern and urban values are seriously eroding the subcontinent's ecosystems. Thapar's careful natural history is enriched by his personal anecdotes and musings on spirituality and culture. His own reverence for the wildlife and landscape he encounters and his brilliant photographs make this book an enthralling read, and it is also a moving argument for more vigilant nature conservation on the Indian subcontinent. In this tribute to mountain lions, well-known authors write about the big cat's presence on the land and in our psyches, the natural history of these animals, people's beliefs and feelings about them, and the past and potential future of mountain lions in America. Big cats are efficient predators that once roamed from the Atlantic to the Pacific, and the Arctic to the Gulf of Mexico. Today, they are confined to scattered, remote habitats. Forest Cats of North America is an intensive look at panthers, cougars, lynxes and bobcats, describing each species in detail. Range maps identify where the cats live and fact files feature scientific and common names, number of subspecies, physical traits, diet, life span and more. Spectacular color photographs capture these cats as they stalk, hunt and raise their young. The fascinating evolution of big cats is covered including the differences between North American and African cats and how the cougar may well be the ancestor of the cheetah. A close-up look at one of the last great predators of North America. In 1983, zoologist Alan Rabinowitz ventured into the rain forest of Belize, determined to study the little-known jaguar in its natural habitat and to establish the world's first jaguar preserve. Within two years, he had succeeded. In Jaguar he provides the only first-hand account of a scientist's experience with jaguars in the wild. Jaguar presents an irresistible blend of natural history and adventure; intensely personal, it is a portrait of an elusive, solitary predator and the Mayas with which it shares the jungle. Strong and sensitive, the book excitingly describes the rewards and hardships of fighting to protect this almost mythical cat." - George Schaller, author of The Last Panda and Wildlife of the Tibetan Stepp.The glimpse which Rabinowitz's painstaking and careful research gives us of the world of the mysterious jaguar is tantalizing ....... Packed with interest and adventure." - Jane Goodall, author of Reason for Hope and In the Shadow of Ma. "An intimate look at the lives of rural Central Americans. At times Rabinowitz resembles a character from Joseph Conrad ... the tension between man and beast becomes startlingly vivid." - The Washington Pos. "A jungle adventure story in the classic mold, of a daredevil westerner who penetrates the deepest jungles of Belize in search of his quarry. There are thrills and chills aplenty in this quest for the mighty feline." - Kirkus Review. Originally published in 1986, this edition includes a new preface and epilogue by the author that bring the story up to date with recent events in the region and around the world. *Examines the past twenty years of research from the world's leading tiger experts on biology, politics, and conservation. *Describes latest methods used to disseminate and obtain information needed for conservation and care of this species. Since the year 1900, cheetah footprints quickly dwindled in African dirt as the species plummeted from more than 100,000 to fewer than 10,000. At the Cheetah Conservation Fund's (CCF) African headquarters in Namibia, Laurie Marker and her team save these stunning, swift, and slender creatures from extinction. Since the organization's start in 1990, they've rescued more than 900 cheetahs, most of whom have been returned to the wild. But this arduous challenge continues. For most African livestock farmers, cheetahs are the last thing they want to see on their properties. In the 1980s, as many as 19 cheetahs per farmer died each year. Cheetahs were considered vermin--but, in learning more about this magnificent species, we know this is far from true. Today, CCF acts as a liaison between the farmers and the cheetahs, in order to promote cohabitation in an ecosystem that cannot thrive without the existence of the precious and predatory cheetah. On a wild ride through the African wilderness--sometimes sniffing out scents left in the dirt--Sy Montgomery and Nic Bishop join CCF in studying the cheetah's ecological, genetic, and behavioral patterns in order to chase down the fastest animal on land and save the species--before it is too late. The jaguar is one of the most mysterious and least-known big cats of the world. The largest cat in the Americas, it has survived an onslaught of environmental and human threats partly because of an evolutionary history unique among wild felines, but also because of a power and indomitable spirit so strong, the jaguar has shaped indigenous cultures and the beliefs of early civilizations on two continents. In An Indomitable Beast: The Remarkable Journey of the Jaguar, big-cat expert Alan Rabinowitz shares his own personal journey to conserve a species that, despite its past resilience, is now on a slide toward extinction if something is not done to preserve the pathways it prowls through an ever-changing, ever-shifting landscape dominated by humans. Rabinowitz reveals how he learned from newly available genetic data that the jaguar was a single species connected genetically throughout its entire range from Mexico to Argentina, making it unique among all other large carnivores in the world. In a mix of personal discovery and scientific inquiry, he sweeps his readers deep into the realm of the jaguar, offering fascinating accounts from the field. Enhanced with maps, tables, and color plates, An Indomitable Beast brings important new research to life for scientists, anthropologists, and animal lovers alike. This book is not only about jaguars, but also about tenacity and survival. From the jaguar we can learn better strategies for saving other species and also how to save ourselves when faced with immediate and long-term catastrophic changes to our environment. The way of the leopard has its origins in the life of a leopard that lived at Londolozi Game Reserve some years ago. This is the extraordinary account of the first scientific expedition to radio-collar and study the rare, elusive snow leopard in its natural habitat. It is also a story of love and high adventure that provides a fascinating, affecting profile of a people inhabiting one of the most isolated and inhospitable regions in the world—the Kanjiroba Himal of western Nepal. In the 1990s, three times as many people were attacked my mountain lions as had been attacked in the previous century. These shy predators must kill to survive, and in areas where their habitats are shrinking, human-cat encounters are on the rise. Stalked by a Mountain Lion tells the stories of attacks and strange encounters between cougars and people and offers a sensitive look at the often complex issues surrounding their interactions. For nine years, biologist David S. Maehr served as project leader of the Florida Panther Study Project. In The Florida Panther, he presents the first detailed portrait of the animal - its biology, natural history, and current status - and a realistic assessment of its prospects for survival. Maehr also provides an intriguing look at the life and work of a field biologist: how captures are made, the intricacies of radio-telemetry tracking, the roles of various team members. He describes the devastating intrusion of politics into scientific work, as he discusses the widespread problems caused by the failure of remote and ill-informed managers to provide support and to communicate effectively to the public the goals and accomplishments of the scientists. He examines controversial efforts to establish a captive breeding program and to manipulate the Florida panther's genetic stock with the introduction of relatives from west Texas. Protection of high-quality habitat, much of it in the hands of private landowners, is the key to the long-term survival of the Florida panther. Unless agency decision makers and the public are aware of the panther's true situation, little can be done to save it. This book will play a vital role in correcting widespread misconceptions about the panther's current condition and threats to its survival. As a wildlife biologist and author, Gerry Parker draws on his experiences and knowledge to explore the origins and existence of the mysterious cat, the Eastern Panther. Significant sitings accounts, as well as field research will take the reader on the adventure of establishing the continued existence of this creature from the past. The Marsh Lions tells the story of a pride of lions in Kenya’s world-famous Masai Mara game reserve. For five years, Brian Jackman and Jonathan Scott followed the Marsh pride and their progeny, recording the daily drama of life and death on the African plains. In time they came to regard them as old and familiar friends and real individuals. The Marsh Lions were the most successful group to be filmed for Big Cat Diary, the BBC’s hugely successful TV series presented by Jonathan Scott. Illustrated with two hundred color photographs, this striking volume reveals the worlds of four neighboring prides that roam the diverse habitats of Botswana's Okavango Delta. Drawing on continuing field research begun in 1995, Pieter Kat shows how Okavango lions challenge long-held assumptions about sociability, mating strategies, and hunting techniques. Pride males readily mate with females from other prides; females often leave their offspring vulnerable to predators; and lions are more prone to hunting mistakes and scavenging than has been commonly believed. Describing the rise and fall of the various prides of lions, and the strength of the family ties that keep the females together and provide security for their cubs, this is a true story of the Maasai Mara National Reserve in Kenya. It also follows the fortunes of the other animals who share this land - the once-elusive leopard, the wild dogs (badly hit by disease and now seriously endangered), and the solitary cheetah, whose life is a constant battle against more powerful predators. But though the Mara is a protected wilderness, it is surrounded by people. The book tells of the Maasai pastoralists, struggling to preserve their culture and the right to their land, the threat of poaching, and the impact that tourism has on this beautiful wildlife sanctuary. Hanby and Bygott, a husband-and-wife team, spent four years observing lions at the Serengeti Research Institute; the narrative-report thereon follows the female pride of the Sametu plain, focusing on one of the sisters and working in representative episodes that reveal the lions' social structure, mating and cub-rearing behavior, hunting and territoriality, along with their responses to what Hanby describes as the ""striking seasonal changes in the food supply." Reviews the latest scientific knowledge available on this unique cat's history, distribution, and ecology and offer suggestions on Lynx management.